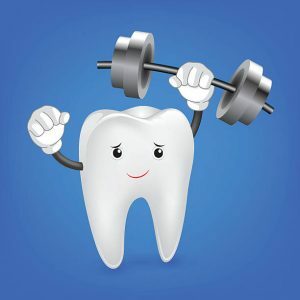 As Orange Theory, Cross Fit , Lifting and Yoga become more popular… I get asked after every dental surgery “When can I go to the gym doc?” My response to each patient varies depending on whether the surgery was minor or major and also type of physical activity. Exercise during the first week after surgery does not increase risk of infection or swelling. The biggest concern with exercise in the first 24-48 hours after surgery is bleeding. And any significant physical activity in the 2-7 day period after a procedure is possibly more pain. On the first two days after a procedure, patients should rest and avoid all strenuous activities. For minor surgical procedures most patients can resume light exercise at 3-5 days after surgery while for major surgeries, patients can generally resume exercise after 5-7 days. In addition, one should take extreme caution if prescribed narcotic pain medications as they cause drowsiness. So lay off on the soul cycle, pilates and cross fit until these recommended average times to resume exercise. If the surgery was more extensive, your doctor may recommend to abstain from your workout regimen longer. To avoid surgical complications, take it easy grab a pint of ice-cream and binge on some Netflix. The following table provides general recommendations for when to resume exercise. Note, every individual and procedure are different and it is best to ask your surgeon for exact recommendations. This entry was posted in Bone Grafting, Dental Implants, Oral Surgery in Children, Periodontal, Teeth Extraction, Wisdom Teeth and tagged atraumatic extraction, atraumatic tooth extraction syst, bethesda, Bone Grafting, dental implant, Dental Implants, dental surgery and exercise, dentist for extractions, dentist for implants, digital implant dentistry, dr. kazemi, easy tooth extraction, exercise after oral surgery, implants, oral surgeon bethesda, oral surgery, peri-implantitis, periodontal surgery, periodontist bethesda, recovery after surgery, resuming exercise after dental surgery, Sinus lift, surgeon, surgery, top dentist, Wisdom Teeth. Bookmark the permalink.